best laid plans! 😉 but I bet it tasted delicious! This looks superb ! The only thing is … I just don’t understand non-metric measurements. 3T = …. 30 grams? One cup milk = 250ml? Is what I am guessing. If ever you should find the time (we’re all so busy, I know! ), I would be so grateful if you could include the metric measurements. Thanks. And please don’t worry if you can’t … I understand. Oh, so glad you reminded me of Delia Smith! Her recipes always work! and I do have one or two of her cookbooks, need to re-visit them! This is the worst sugar cookie recipe I’ve ever seen in my life. Having said that, this is an excellent souffle recipe and I love your insightful comments at the end. I think souffle is a dish more people should attempt as it is far easier than its reputation suggests. It’s also a great way to use up small amounts of leftover ingredients. And it impresses the impressionable! What more could one ask of a dish? well, well, well, if you are against a little veggie in your sugar cookie, there’s really nothing I can do, but label you as a very picky person, with a narrow mind. Sad. Bigly so. You just wait til we build that wall between Brazil and America, and kick you back over it. And Brasília is gonna pay for it!! Oh yeah, I forgot about that canal. Hmm. We might need to bring in some Mexican workers…. it always makes a dinner feel special, isn’t it? Gostei dessa receita. E da ideia de untar com manteiga e queijo parmesão. (nunca tinha ouvido essa ideia; mto boa). Uma hora dessas experimento. voces vao adorar, tenho certeza! Lovely consistency Sally. I have had success with soufflé before. However, it depresses me when they shrink by 50% between oven and table. 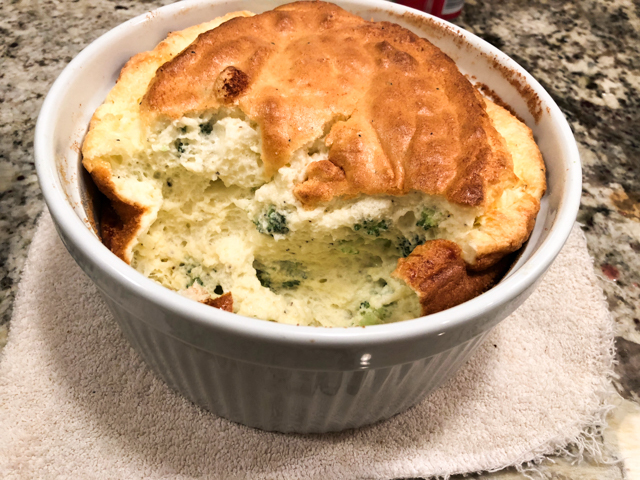 Haven’t made a vegetable soufflé awhile and I love broccoli – so thank you for the nudge! Never use a microwave, and, besides the ‘nuking’ issue love the exactness I can get when I steam vegetables – quite my favourite method. Am smiling at Conor’s comment . . . I always make sure my tableful of friends are sitting there waiting for their dish to avoid that ‘deflating’ experience . . .
I’ve only made soufflé once (and it actually worked which was at least half the joy) but never a broccoli soufflé. I just love this idea – something different from the usual and it brings a festive flair – definitely passes as a veg side too 🙂 might just have to incorporate it into the Christmas menu this year. Your golden top looks amazing (une belle réussite) and, yes, Family Hold Back is the term we use here – haha! 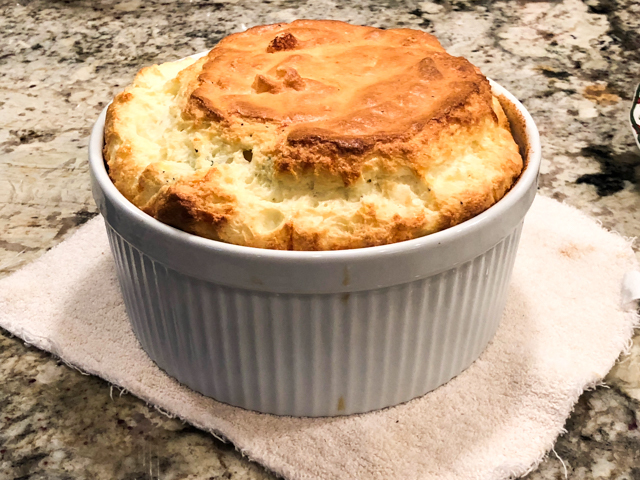 I don’t know why I don’t think of making a soufflé more often, it’s such a delicious and easy dinner. You can’t go wrong with Julia Child. Thanks for the reminder. Did someone who shall remain nameless object to the pause for the photograph? let’s say the individual did not object, but was absent-mindedly parked between me and said souffle, at that point collapsing quickly. P.S. This looks amazing. 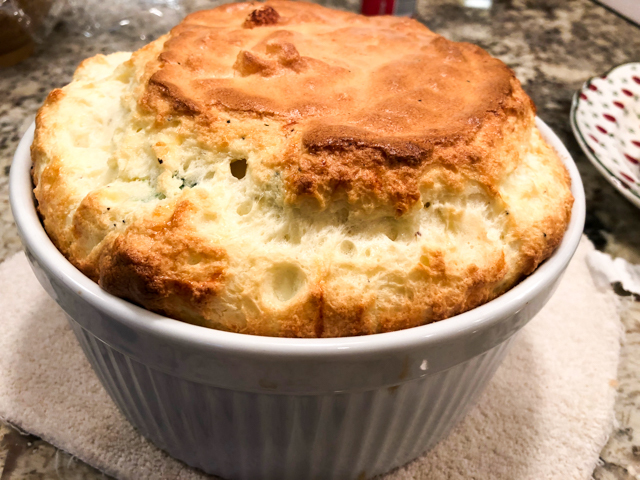 It’s been so long since I’ve made one (I used to make spinach souffle all of the time, but I’d make individual servings due to lack of confidence. I have a gorgeous large souffle dish that I’ve owned for 40 years that I’ve never actually made a souffle in. Sheepish grin. oh, you MUST use that dish!!!! and then showcase it in all its vintage glory on your blog!